HomeOpen Back Headphone ReviewsAudeze EL8 Review | ASTONISHING ELEGANCE! Audeze EL8 Review | ASTONISHING ELEGANCE! Before we get into the Audeze EL8 Review, grab a snack, sit back and relax because..
Driver Size: 100mm. What is a Headphone Driver? Impedance: 30 Ohms. What is Headphone Impedance? Sensitivity: 102 dB SPL with 1mW input. What is SPL? Total Harmonic Distortion: < 0.1% at 1kHz at 1mW. Color: Black with Wood veneer accents. Material: Die cast metal, protein leather. As for the EL8, it comes in a closed back or open back model. Today I will be reviewing the open back version. Closed back vs. Open back headphones. For starters, this headphone exudes pure elegance. It’s just about the classiest can that I personally have come across, and I really appreciate the workmanship that went in. For a planar magnetic, it’s actually not as heavy as you would imagine, but it is heavy enough to put your mind at ease. I don’t see this one breaking down any time soon. 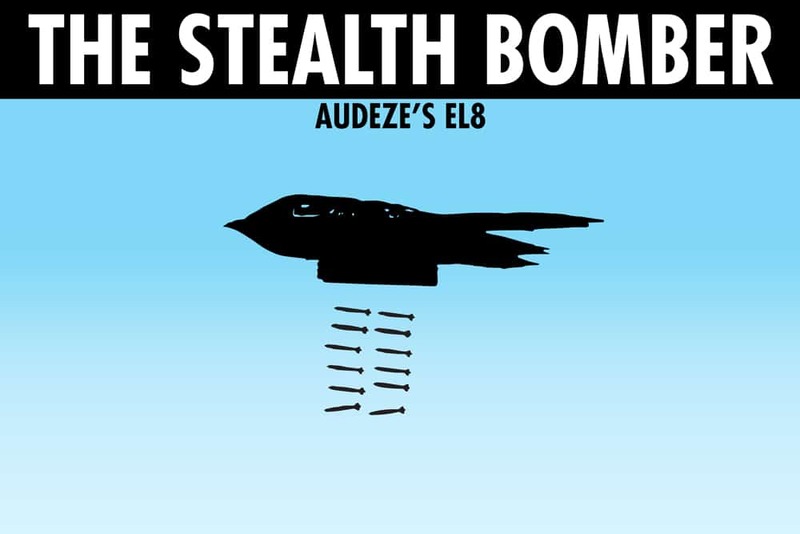 I see the EL8 as a stealth bomber. It’s not sleek by any means, but rather has this amazing matte black finish that makes you want to hold it in your hands. I must have spent at least a couple of minutes just playing with it in my hands and admiring the quality. As for comfort, it’s through the roof. I didn’t have to take them off at all, and I had them on for 1-2 hours. With most headphones you will have to make some sort of adjustment at around the 45 minute mark from my experience. This baby has just the right amount of clamp, though I did hear that brand new out of the box it is a little tight. They definitely open up nicely with some wear. The pads are really meaty as well, and are made of probably some type of protein leather. They’re perfect. The overall sound is what I would describe as extremely relaxed and balanced. Do take note that the bass overall takes a back seat to the rest of the frequencies, but is still integrated nicely into the overall scheme. Smooth, relaxing type of sound. Not aggressive or Sibilant at all. What does Sibilant mean? Does well with faster music. This is something that I always get worried about in detailed headphones. Can they keep up with the rhythm of faster music? The El8’s do with flying colors. Sound can get a little distant at times and boxed in so to speak. These sounded phenomenal out of my Android device, but an amp is very much recommended for more serious listening sessions in studio. How to choose a headphone amp! To sound their best, you will need a high quality Amp/DAC with higher quality source files. More on that in a bit. I found these to be great with pretty much all genres. They seem to be very versatile, handling the frequency spectrum with ease. The EL8’s come with a proprietary flat jack connection, which I’ve never come across before. The cable is also flat (think a flat-head screwdriver shape), and doesn’t tangle in the slightest. I really enjoy the quality of it as well. It doesn’t feel overly cheap or heavy. It’s a nice size, and over 6 feet long. Audeze’s patent pending “Fluxor Magnetic Technology” means that instead of the magnets inside the driver being magnetized vertically and horizontally, they are magnetized on a 45 degree angle. They also transfer more energy on the driver facing side than the backside. In layman’s terms, this results in reduced weight with greater efficiency to work with mobile devices. Audeze’s Fazor Technology places acoustical elements on each side of the magnet, basically giving the sound more clarity and better imaging, while also preventing phasing. Phasing is when sound waves cancel each-other out. This is basically what happens in a sub-par pair of headphones; the sounds start to run together and there’s no sense of instrument separation. These can sound a little boxed in at times, even a bit distant. I didn’t find it to be a huge deal, but it is something that I noticed. From song to song, I noticed that certain mixes sounded much better than others. I believe this to be the honesty of the cans. I would try to focus on listening to the best sources possible; stuff like FLAC, WAV, and generally anything 320kbps and up. With both Deezer and Spotify these sounded great, but you could definitely discern the bad tracks from the good ones. On Pink Floyd’s Have a Cigar in particular, there was this sense that I had been missing a lot of the subtle details, which is something I live for when it comes to headphones. This is always what I’m after. I want to hear everything, good or bad. Think of these details like raindrops. They’re kind of small, but when it’s just starting to rain you feel them. There’s simply a lot of cool background stuff that comes alive with these. As alluded to before, the bass does take a back seat but isn’t absent. I’ve really come to enjoy a more toned down bass response as I’ve gotten older. When it’s immersed in the music, it feels as if it’s a part of, and not trying to dominate. That said, here it’s very articulate and detailed. I’m clearly able to pick notes apart and get a sense of style in the artist. It’s about definition and accuracy, not oomph here. One of my favorite aspects of this headphone is the clarity. I had a much easier time deciphering lyrics than I perhaps ever have. On Common’s Act too.. The Love of my life, he seemed to be a lot easier to understand. I could follow the lyrics better, whereas in time past he may have sounded muffled or distant. Certain lyrics that seemed difficult to make out became extremely clear with the EL8. The ear-cups rotate inward, allowing you to lay them flat on your desk if you so please. Overall they don’t have an incredibly large range of motion, but there is some freedom there. The headphones don’t fold however, which does not make them a great candidate for on the go. Because of the fact that they don’t have a carry case and aren’t fold-able, I wouldn’t personally take these out. I think you could get away with using the closed back version on the go, but these are most definitely a studio headphone. The Soundstage here isn’t huge by any means, but I did feel like the sound was spread more evenly across the palette. You really start to get a sense of space with these. What is Soundstage? Build and comfort amazing. Sound phenomenal. Soundstage could be a bit wider, but I presume Audeze didn’t want to make this headphone quite as good as their LCD series. Still, the attention to detail is almost unrivaled here, with the precision and balanced sound to match. These are simply exquisite. I would absolutely recommend them, but I think I’ve beaten this horse to death. Now, if you’re looking for something more affordable, and are after the absolute Gold Standard in open back dynamic headphones, why not give the HD600’s a try? Pound for pound, their Price to performance ration is virtually unmatched, and they serve as the quintessential benchmark headphone in any category. Interested in finding out why? Well that’s about it for today my friend! I hope you’ve enjoyed this Audeze EL8 Review. Which of these tickles YOUR pickle? Would you invest in the EL8? What do you think of the HD600? I would love to hear from you. Until next time..
HIFIMAN HE400i Review | INTIMATE! HIFIMAN HE400S Review | STELLAR SOUND!